14th August 2017, Dubai, U.A.E. 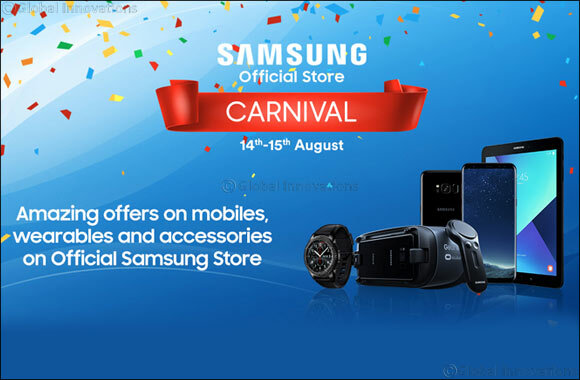 : SOUQ.com is hosting a two-day Samsung carnival from 14th - 15th August for customers to get access to an extensive range of Samsung’s latest products at exciting and unparalleled offers. The electronics extravaganza will see new flash deals every four hours throughout the event across Samsung Mobiles, Wearables and Accessories. Customers can benefit from the incredible deals on the one-stop-online shop for Samsung on SOUQ.com, and own the latest technology at click of a button. SOUQ.com has partnered with Samsung to provide Key Flagship products on sale include Samsung Galaxy S8/S8+, Samsung Galaxy S7 Dual SIM, Samsung Galaxy Book 10.6, Samsung Galaxy On7 Prime, Samsung Galaxy S7 Edge, and Samsung Galaxy A series 2017. With an array of exciting deals to avail from a large assortment of products of their favorite brand, the two-day carnival is set to be a mega hit for the tech-savvy customers.